Driving next to large 18 wheeler trucks can not only be intimidating, but dangerous. There is no question that when it comes to accidents involving these vehicles, the injuries—and deaths—can be significant and extreme, especially when it comes to accidents that arise out of their blind spots. 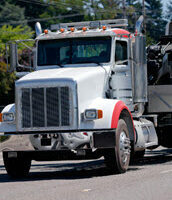 First and foremost, if you’ve been in a truck accident, seek medical care as soon as possible. This is crucial even if you think you are completely unharmed, as some accident effects cannot be detected until days later, such as undetected concussions. While these are commonplace in truck accidents, they are also frequently misdiagnosed and/or treated improperly because they do not always involve loss of consciousness, which is what EMTs who first arrive at the scene will frequently look for. Also make sure that everything has been documented—not only with police reports—but with pictures, and before you speak with any insurance companies, make sure that you consult an attorney, as you do not want to make any statements that could compromise your ability to collect what you need to address any medical expenses you may incur. This is especially important if a family has lost a loved one in one of these accidents, as times of stress and sadness can be taken advantage of by insurance companies seeking to limit their payouts. While truck drivers and their companies are beholden to a number of federal and state laws that govern their driving licenses, the number of hours they can drive in back-to-back shifts, maintenance on the trucks, etc., often, these laws aren’t followed, and even when they are, accidents occur. When it comes to large truck accidents, according to some statistics, roughly 10 percent of all related crashes can be attributed to vehicle malfunctions, such as defective tires. And while a malfunction like this might sound like an ordinary event in a regular four-door vehicle, when it involves an 18 wheeler, the consequences are often catastrophic. This is especially the case when that malfunction involves a brake problem. The vehicle or parts manufacturer (for product liability). At The West Law Office, we focus on helping our Texas clients who have been injured or lost a loved one in 18-wheeler accidents. If you have been involved in an accident in Houston, Katy, or a surrounding area, contact us immediately to find out how we can help. © 2019 The West Law Office.